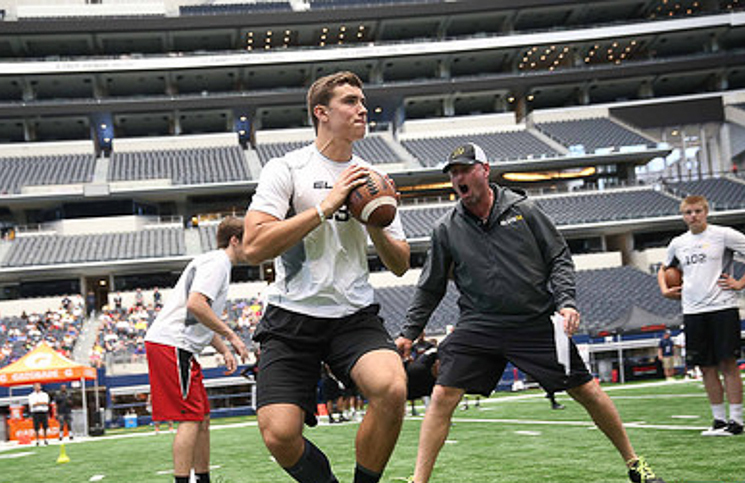 The Vols got their quarterback for the 2015 class when Quinten Dormady of Boerne, TX pledged to Butch Jones in June. The commitment came on the heels of a visit to Alabama where Dormady picked up an offer from the Tide. When it came down to deciding between orange or crimson, Dormady said it was the people he met in Knoxville that swayed him. Dormady plans to enroll early, go through spring practice, and get a head start on picking up the offense and getting acquainted with his new teammates. He plans to visit Tennessee officially for the Florida game and has no plans of entertaining other schools that may continue to recruit him. Dormady said he feels comfortable with the offense that Jones and Bajakian run and that even though he is listed as a pocket passer, he feels like he is mobile enough to make plays in this system. When pushed about any personal goals he may have upon arriving at Tennessee, Dormady was very quick to put the attention on his team and not his personal aspirations. Dormady also made it very clear that while it may take some time, the goal for him and everyone in the 2015 class was to hoist the crystal football before leaving Knoxville. “That’s the goal, to win a national championship. It isn’t going to happen overnight. It’s day by day, day in and day out, and it’s hard work. We aren’t going to wake up one day with championship rings on our fingers, but we want everyone to understand what the goal is if you come to Tennessee. Quinten’s father, Mike, is the head coach at Boerne High School and while some might think that a coach and quarterback dynamic between father and son would be problematic, Quinten says he enjoys playing for his dad and is looking forward to his upcoming season. I’d have to go with any type of pasta. I would just say that I’m a family guy and that I genuinely enjoy spending time with them. Drew Brees. I would have said Peyton, but I think I’ll actually be able to meet him and talk with him now so I decided to pick someone else.